A year ago we saw this bike on the pages of a few bike magazines and were impressed with the attention to detail and dedication to flip this softie into a legitimate bagger. Now that it’s up for sale on eBay we wanted to share the details from the seller’s ebay listing. Kirk VanScoten had purchased a new Heritage Softail from Utica HD a couple years ago using it for new model fender and saddle bag fitment. Color and design are the two essentials when making a custom scoot. Kirk had come up with a new bluish purple powder that had tremendous depth to it. The design idea came when Walt Sipp of Pro Charger, who Sumax powder coats products for, asked Kirk if he wanted to do a marketing project together. Kirk enlisted Kevin Boyle, owner of Motorcycle Medic located in Pittsfield Mass. to be the master mechanic for the bike’s construction. Kirk knew Kev’s attention to detail would make this an eye popper and extremely roadworthy. 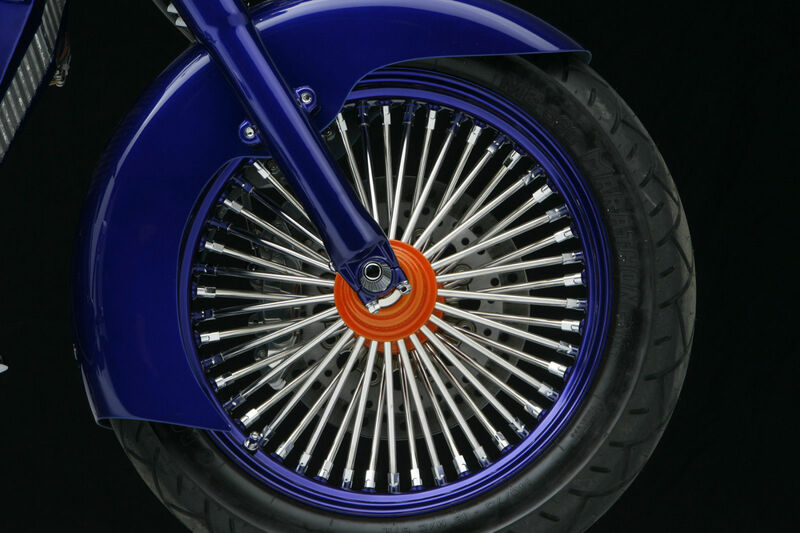 Big Spoke 18″ wheels are from Ride Wright. Sumax powder coated the hubs orange and the wheels their Bentley Blue. Metzler ME880 skins front and rear. Rotors and brake lines by Russell while all braking is done by Jay Brake Calipers. The frame and swingarm are stock. The big 200 series Metzler on the back is courtesy of the Motorcycle Medic’s Wide Drive Kit. 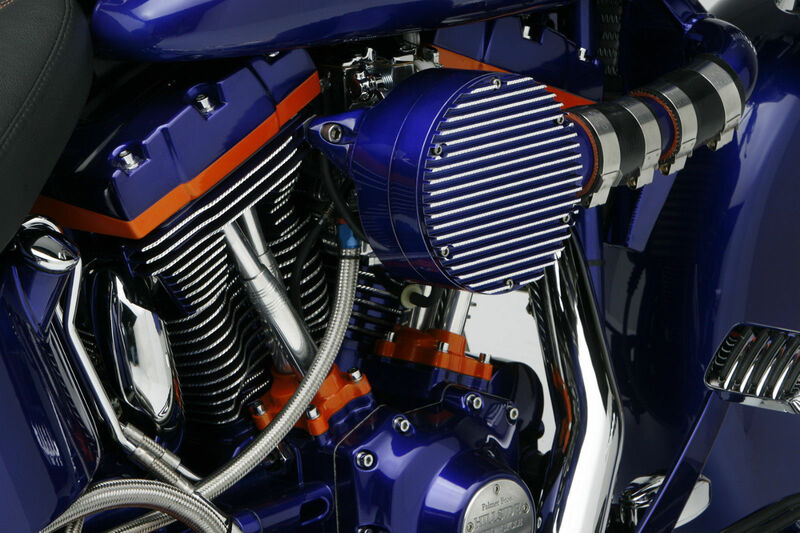 This effective low cost set up allows you to retain your stock swingarm and brake hanger. The Heritage front end is a classic. 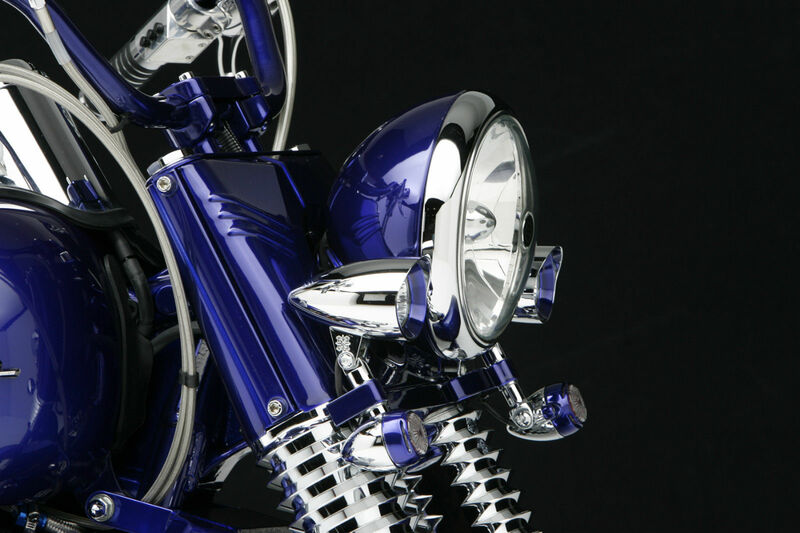 Headwind 2″ spots, Kuryakyn directionals and Arlen Ness retro boots add some bling. 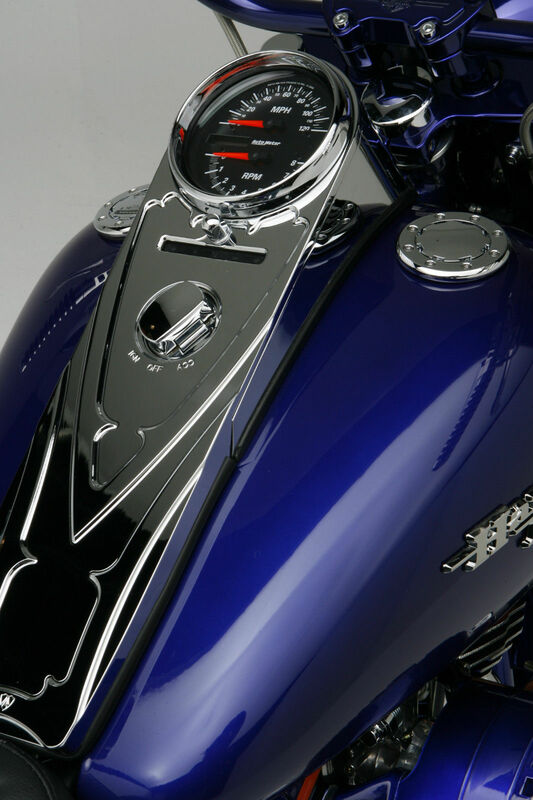 The Hugger front fender is a popular Sumax composite glass fender. 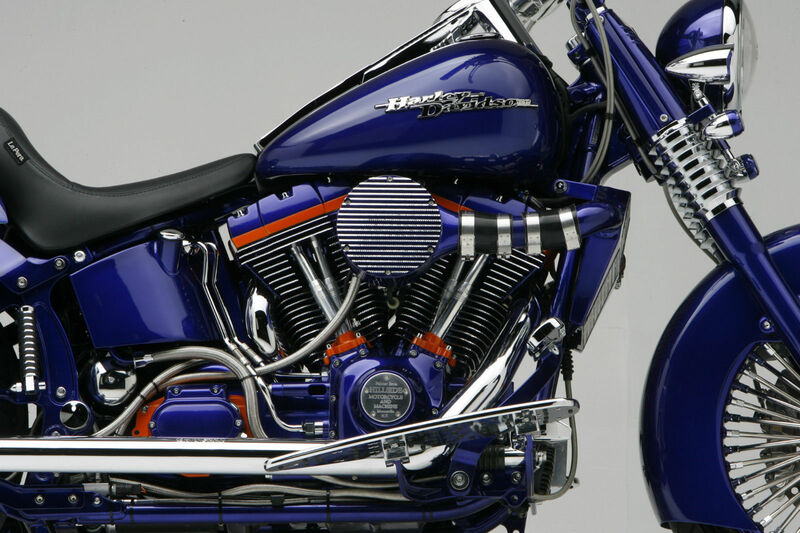 Stock HD Fat Bob tanks with chrome Harley logos give the look of a Street Glide. 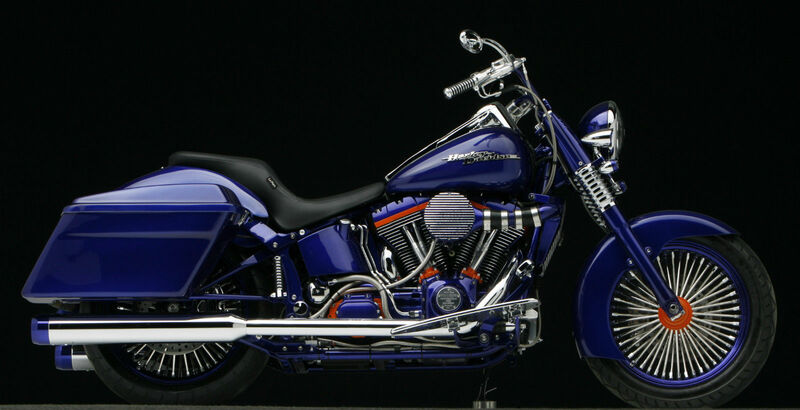 Handle bars are stock with Jay Brake handle bar master cylinders and controls. Autometer’s speedo / tach sits in the Arlen Ness dash. Ness mirrors, grips and floorboards complete the look. Kirk fabricated a rear sub fender and fender overlay for the bagger theme out of their composite glass. 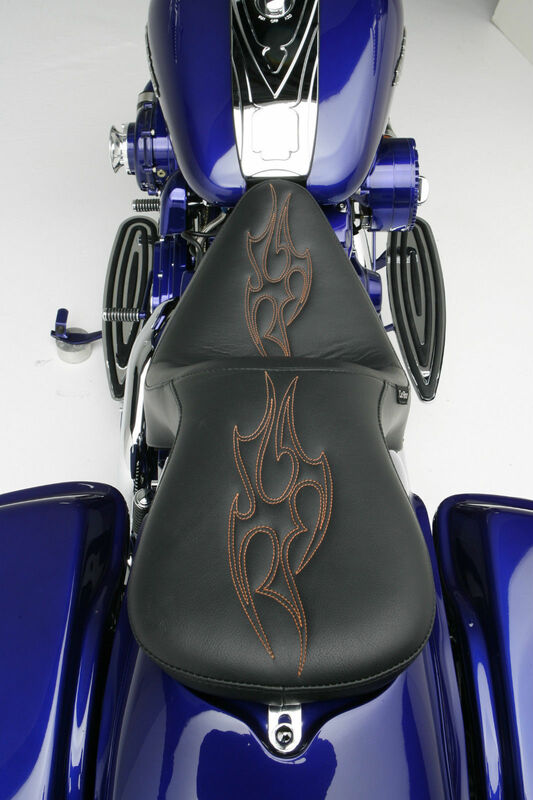 Bob at LePera accented the rich looking Sorrento custom seat with orange tribal flame stitching. It sits down inside the overlay for a sculptured look. The Sumax saddle bags feature a pair of 1939 Ford style LEDs with “run, turn & stop” functions. The paint really sets off this bike. Kirk went to long time friend John Kosmoski, who founded House of Kolors paint, to match his powder. John took his UK13 Burble and added a touch of UK5 Cobalt for a precise match. Chris Barris laid down multiple coats of liquid paint on the sheet metal while the Sumax crew powder coated with their Bentley Blue just about everything else. 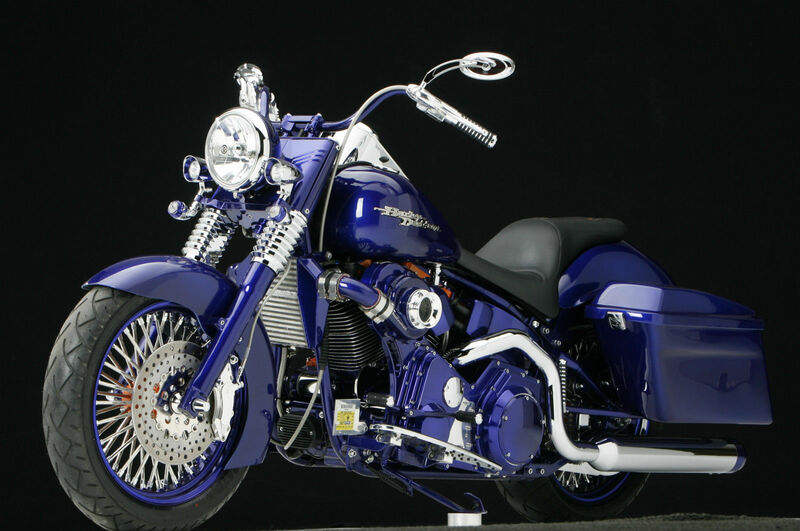 This bike was first Bagger featured on the cover of Easyriders magazine. It is now in the April 2012 issue of Baggers magazine. To replace this bike would cost in excess of $40,000.00. Bike available on ebay. 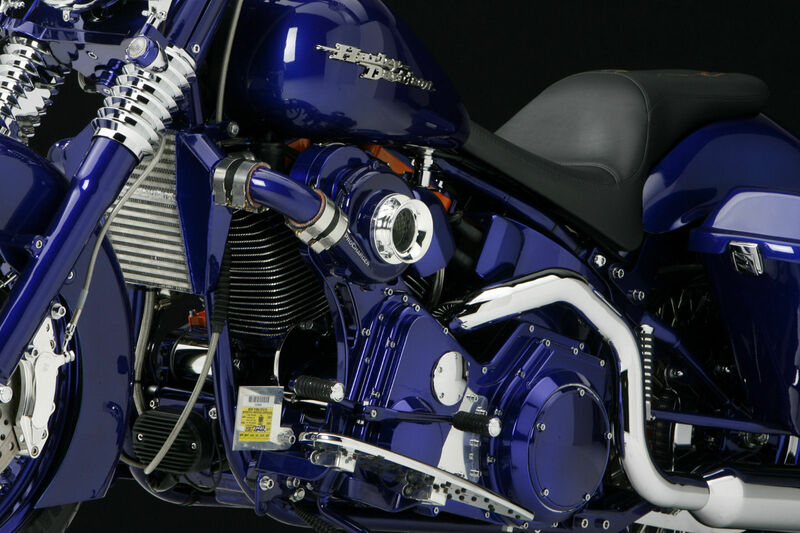 Beantown Baggers is not associated or responsible for this listing or bike – but we really like it!